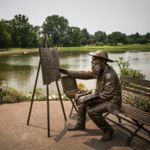 Why go to Giverny, France to paint in Monet's garden when your Arboretum is equally as stellar and far more accessible. Capture the romance this garden offers in a one-day acrylic painting experience taught by a professional painter. Our garden is a bountiful collection of blooms, pond, bridge, and enough lush diversity to rival the French original. You will learn how to hone your skills by sketching then using acrylic paints to finish the day with a dazzling masterpiece to take home.